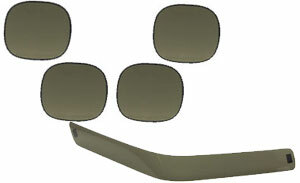 These aerodynamic C4 Corvette Blackout Kits are manufactured using only the finest qualities of acrylic. Constructed with ease of installation in mind, these sleek looking kits require absolutely no modifications. The kits are comprised of two front grille covers and optional four tail lamp covers, with included mounting hardware. The smoke gray acrylic covers are transparent when your lights are on, but check local regulations just to be safe. Please use the drop-down menu to select from the available options. Q: Do these pop on and off for car shows? How are they attached?